Potato (87%), Beer Batter (7%) (Wheat Flour, Wheat Starch, Natural Flavour (Wheat), Salt, Raising Agents (450, 500), Wheat Gluten, Beer (Barley)), Canola Oil. Contains gluten containing cereals. Made in a facility that also processes products with milk, sulphites. 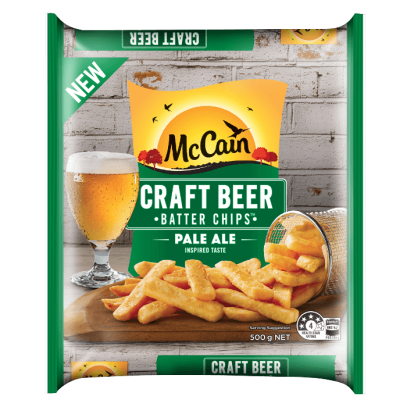 Spread McCain Craft Beer Batter Chips in a single layer, on the middle shelf.